Newport Beach is hailed as the Beverly Hills of Orange County; Newport Beach is nothing short of a beautiful city with beautiful people. It’s no wonder why cosmetic and hair transplant surgeons are in high demand in this city. US Hair Restoration caters to Newport Beach as well as provides reasonable and competitive pricing for its residents. Newport Beach’s rich history makes it an ideal place to work and live and with today’s demand for quality work, we are proud to be a part of it by offering state-of-the art hair transplants. Being involved with the most recent advancements in the hair transplantation field puts US Hair Restoration way ahead of most its competitors. Newport Beach is one of many cities that come to us for their Hair Transplant needs. 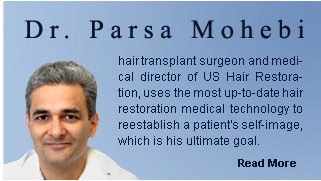 Dr. Mohebi, medical director of US Hair Restoration spends quality time with his patients, meticulously examines every patient personally and comes up with a master plan, which includes medical and surgical treatments for hair restoration along with cosmetic changes that need to be done so patients can show off their restored hair in relationship with other components of their face.